​St. John Vianney, Model of Purity O holy Priest of Ars, your life was a model of purity. Your life of chastity was a source of edification to all. You said that when a soul is pure all the court of heaven looks upon it with great joy. Today we are experiencing a great disregard for the virtue of purity; it is looked upon with ridicule by worldly standards. O great St. John Vianney, more than ever before, we need your prayers and help in avoiding sins of impurity. I ask you to help Father ___ to keep pure in mind and in body and give good example in his speech, conduct and in his faith. Obtain for him the strength necessary to combat temptations against the virtue of purity, which could lead him away from God. Unite your prayers with those of Mary Immaculate to implore God that Father ___ be pure in mind and heart and preserve him from those sins which are so displeasing to God. 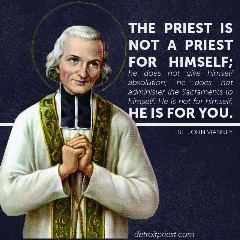 O holy Priest of Ars, St. John Marie Vianney, you loved God and served Him faithfully as His Priest. Now you see God face to face in heaven. You never despaired but persevered in your faith until you died. Remember now the dangers, fears and anxieties that surround Father ___ and intercede for him in all his needs and troubles especially console him in his most difficult moments, grant him serenity in the midst of crisis, and protect him from evil. O St. John Vianney, I have confidence in your intercession. Pray for Father ___ in a special way during this novena.